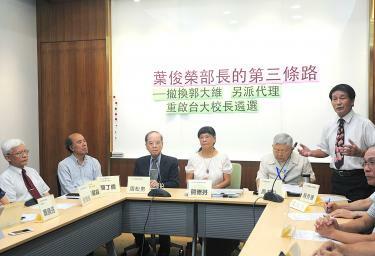 National Taiwan University (NTU) veterinary expert Lai Shiow-suey, right, speaks at a news conference in Taipei yesterday, as colleagues, including NTU professor emeritus Ho De-fen, fourth left, listen. A group of National Taiwan University (NTU) professors, alumni and their supporters yesterday urged the Ministry of Education to fire NTU acting president Kuo Tei-wei (郭大維) after he refused to hold a new presidential election. Kuo is no longer qualified to serve as acting president, because he has violated the Public Functionary Service Act (公務員服務法), the University Act (大學法) and other regulations by disobeying the ministry, delaying a university council meeting and blocking several proposals to resolve controversies surrounding the university’s presidential eslection, they said in a joint statement. Kuo’s term as acting president has been extended indefinitely since April, when he ignored the ministry’s order to hold a new presidential selection and instead filed for an administrative appeal, requesting that the ministry appoint NTU professor Kuan Chung-ming (管中閔), who was elected by the university’s presidential election committee in January, but later deemed unqualified by the ministry due to a conflict of interest in the election process. Minister of Education Yeh Jiunn-rong (葉俊榮), who took office in July, has said that he hopes to resolve the issue through friendly communication with the university, but hinted that he might take a tougher approach if no agreement could be reached within two months. “Today is the beginning of a new semester, as well as Yeh’s two-month deadline. He has constantly talked about improving the selection regulations, but in the past two months, all we have seen him do is arrange secretive meetings with those who have broken the law,” NTU professor emeritus Ho De-fen (賀德芬) told a Taipei news conference yesterday. She urged the ministry to resolve the issue by relieving Kuo of his position and appointing a new acting president to launch a new presidential selection. “As a public sector employee, the acting university president should follow orders from the education ministry, its regulatory authority — and, in this case, the Control Yuan has also issued corrective measures for the university — but Kuo has completely ignored them,” she said. Moreover, at a university council meeting convened in May to address the controversy surrounding Kuan’s election, Kuo banned the media from attending and manipulated the procedure to prevent any of his potential opponents from speaking or presenting proposals, she said. “Has he not betrayed all the principles essential to universities — of democracy and the rule of the law?” she asked. The ministry’s inaction would make Kuo “a president forever,” which might be what he is hoping for, she added. “The incumbent acting president is illegitimate. One cannot be an acting president indefinitely,” Academia Sinica academician Chou Chang-hung (周昌弘) said. According to university regulations, the presidential selection committee should be dismissed once a president has been selected and an acting president cannot serve for more than seven months, he said. An online petition launched about a week ago by NTU professors and alumni requesting the removal of Kuo has gathered about 200 signatures, Chou said. “If the education minister does not fire Kuo, tthere is no way to resolve the issue legally. In that case, I propose that NTU faculty members and students occupy the university president’s office and members of the public occupy the education ministry,” NTU professor emeritus Tsay Ting-kuei (蔡丁貴) said. After the news conference, the group visited the ministry and handed over a letter of request, which was received by ministry secretary Chu Nan-shyan (朱楠賢). The ministry is “open to exchanging opinions with different people,” Chu said. Presidential adviser Koo Kwang-ming yesterday speaks at a news conference held by the Taiwan Brain Trust in Taipei to announce the think tank’s latest poll results on the 2020 presidential election. President Tsai Ing-wen’s (蔡英文) low polling figures yesterday drew fire from within the pan-green camp, as presidential adviser and independence advocate Koo Kwang-ming (辜寬敏) called for Tainan Mayor William Lai (賴清德) to run for president in 2020.